The S&P 500 increased 13.07% in Q1 2019 which was the best quarterly increase since Q3 2009. With Q1 GDP growth expected to only be 1.31% according to the NY Fed’s Nowcast and 2.1% according to the Atlanta Fed’s Nowcast, few macro based investors focused on this quarter comprehend why stocks have been doing so well. 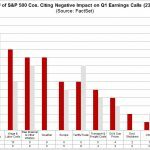 Investors focused on this quarter’s S&P 500 earnings are also confused because Q1 earnings are expected to fall 3.9% as estimates collapsed in January and February. The main catalysts of this equity rally in the beginning were the fact that the economy wasn’t going into a recession, the Fed’s transition from being hawkish to dovish, and the potential end of the trade war. The continuation of the rally is based on the thesis that economic growth will rebound after this weak Q1. 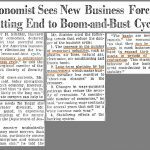 Some investors are skeptical of this thesis because economic growth is still falling. Many economic reports’ growth rates haven’t hit a bottom, yet stocks are increasing. The timing of the rally is a bit off. Traders really jumped the gun betting on a recovery in March while a lot of data is still weak. However, these traders have been rewarded handsomely because not every rally fits in a box. Specifically, the stock market doesn’t work on a fixed time clock where it always reacts the same way to changes to the economy. If the stock market sold off exactly 6 months prior to every recession, traders would game the market until that clockwork was changed. The ECRI leading index is now starting to show one of the first signs that this slowdown will end. As you can see from the chart below, the weekly leading index’s yearly growth rate in the week of March 22nd was -1.4% which is a nice improvement from the 2.2% decline in the previous week. The index increased 1 point, so it wasn’t just easier comparisons that helped it. To be clear, the ECRI leading index still implies growth will be weak in Q2 and Q3 because it projects growth 2-3 quarters ahead of time. The improvements now are all about late 2019 and early 2020. However, it’s still great to see green shoots for a potential recovery in the next year rather than a recession which some bearish investors are calling for because part of the yield curve has inverted. The level of euphoria in the market is subjective. You can look at moving averages, PE multiples, price returns, or other oscillators. For example, the CNN fear and greed index is at 49 which is neutral. It’s remarkable that the market ended the month with a 1.79% gain and it is near its 2019 high, yet it is still not overbought according to this indicator. Another indicator not close to showing froth is NYSE margin debt. It’s a chart crime to look at nominal NYSE margin debt; margin debt should be looked at as a percentage of the overall market. Margin debt as a percentage of the Wilshire 5000 is about 2% which is a 13 year low. In 2008, it briefly peaked at 2.8%. As you can see from the bottom charts below, yearly margin debt growth is a solid measurement of euphoria. Growth peaked in 2000 and 2007 as the prior two bull markets reached their final summit. The current market is dramatically different from those peaks as margin debt is down yearly. 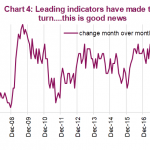 The Merrill Lynch fund manager survey showed cash positions were the highest since January 2009. The new home sales report has heightened volatility, so take the results with some caution. However, it’s still better to see good results than bad ones. February new home sales were 667,000 which beat estimates for 615,000. The January reading was revised higher from 607,000 to 636,000. The 3 month average was 630,000 which is the best since last June. New home sales should improve further in March given the collapse in mortgage rates. Supply fell from 6.5 months to 6.1 months. Yearly price growth was -3.6% as the median price was $315,000. Yearly sales growth was only 0.6%, but this report was still solid given how weak the housing market was in the 2nd half of last year. Consistent with most other housing reports, the West was the weakest region at -2.9% yearly growth and the South was the strongest at 6.8% yearly growth. The chart below shows recently homebuilders have been moving towards building homes at lower price points. 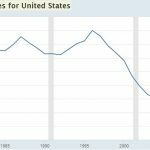 The new home price premium to resale is the lowest since 2009 as it is below 25%. However, it is still above the long run average of 17.1%. You can spot a perma bear if he/she only cites the Conference Board survey and you can spot a perma bull if he/she only cites the University of Michigan report. We study both because we’re focused on the truth rather than trying to push a thesis that isn’t fully supported by evidence. 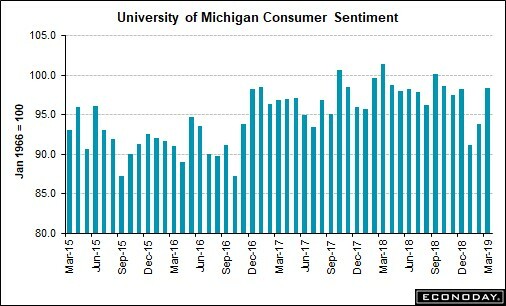 On the heels of the Conference Board survey which showed weakness, the final University of Michigan consumer confidence report beat estimates which were already high because the preliminary report was strong. As the chart above shows, sentiment was 98.4 which beat estimates for 97.8 and was above February’s reading of 93.8. The last 2 weeks of March had a pace of 99 which would be a 6 month high. Current conditions increased from 108.5 to 113.3 and expectations increased from 84.4 to 88.8. Another great aspect of this report was that more than 100% of the gains were catalyzed by the bottom 2/3rds of income distribution. The bottom 2/3rds were up 7.1 points and the top 2/3rds were down 1.1 points. This gain along with builders pushing for cheaper new homes puts the middle class in a rapidly improving state. Wages are improving greatly for most Americans as the highest percentage reported income gains since 1966. 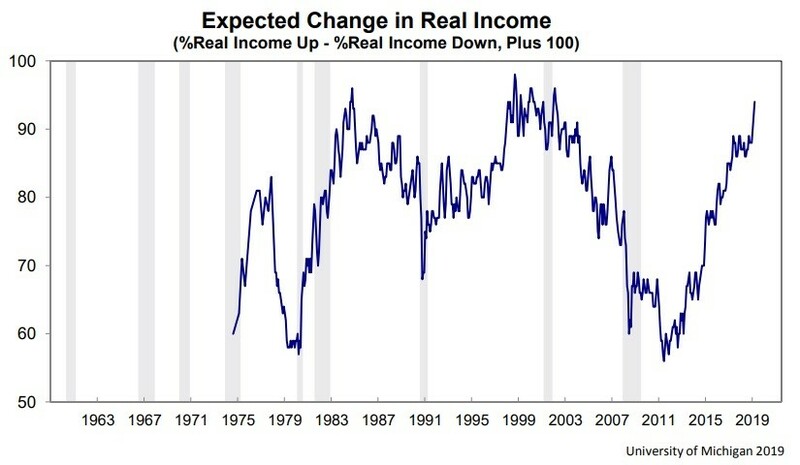 Because of this Goldilocks scenario where there is a tight labor market and low inflation, the chart below shows the expected change in real income is historically high. Jobless claims are low, inflation is low (January PCE inflation was 1.4% and core PCE inflation was 1.8%), middle class consumer confidence is improving, real wage growth expectations are high, home builders are starting to focus on building more affordable housing, yearly margin debt growth is negative, and yearly ECRI growth is improving. That’s quite the combination to help push stocks higher. It’s a Goldilocks scenario. We didn’t write this article with the goal of promoting a positive viewpoint (nor a negative one). That’s just how the results came out. PreviousJobless Claims Are Amazing. Why Be Bearish?